While Magic AB certainly isn't something you need, any producer would find this a very useful tool. Good idea. Makes AB referencing effortless. MIDI track switching and multiple loops per track options next please! Well, this one couldn't really be any simpler. Magic AB - soundware developer Sample Magic's debut plugin - solves a problem that you may not have realised you have. "The DAW output is sent through Magic AB's A channel, while the reference track outputs through B"
Magic AB runs as an effects insert on your master output. Load up to nine tracks (WAV, MP3, MP4, etc) into it, hit the power button next to the one you want to play, and activate playback in the plugin and your DAW. The DAW output is sent through Magic AB's A channel, while the reference track outputs through B. Hit the big A and B buttons under the meters to switch monitoring between them, or swap the waveform display for an even bigger pair of buttons that can be assigned a MIDI CC. 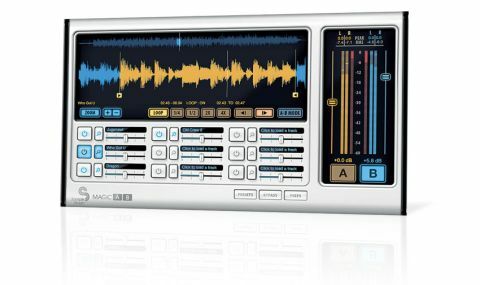 Each channel has a level control, for balancing, and the level of each reference track can be offset from this using the gain fader under its slot. The waveform display shows an overview of the whole reference track at the top and the currently zoomed area underneath, and each track can have its own loop assigned for repeated playback of a section. The loop range can be doubled/quadrupled/halved/ quartered in length at a click or adjusted manually. You can set the fade between reference tracks from 0-2000ms, and choose to automatically import all loaded reference tracks into a named folder or not. And that's basically it! It all works exactly as described, making the AB referencing process an effortless joy. We'd like to be able to switch between tracks via MIDI, and multiple loops per track would also be good, but as it stands, while Magic AB certainly isn't something you need, any producer would find this a very useful tool.